Really nice, quiet place to live.submitted by Kelsey D. - Mar 25, 2019 |Recommended: YesPeaceful, great amenities, pleasant staff and maintenance. response from property - Mar 27, 2019 Thank you so much for the kind words. As always if there is anything else we can do please let us know. response from property - Jan 21, 2019 Keith - I'm sorry to read this review. We would love to talk to you about some transfer options if you would like. We truly want you happy in your home. Nice apartmentssubmitted by Amber D. - Nov 27, 2018 |Recommended: YesI was a bit spoiled in my previous apartments, so I couldn't bring myself to move into anything that wasn't less than 5 years old. Aura at Quarterpath was the only one that fit my budget. I like that the entrances are all indoors and that there is restricted access to the building. It makes me feel safer. I don't have any issues with noise but I waited so that I could get an apartment on the top floor. There is not much of a community as I barely ever see anyone else in the halls but this isn't a huge deal for me. The halls do smell funky at times but I think that's due to the trash cans by the elevators. All the appliances and fixtures work fine and there is a ton of storage space in the bathroom, even in a one bedroom. Very nice, upscale luxury apartments. Property management team takes care of its tenants very well.submitted by Daniel P. - Sep 07, 2018 |Recommended: YesIt's a great place to stay, especially if you own pets. The property management team here takes very good care of its tenants and try's to host special events throughout the year. There are plenty of amenities that make staying here more enjoyable like the gym, pool, guest lounge, pet cleaning facility, and garages. The apartments are for the most part quiet. However, on occasion, you can hear the people above you walking around, but that's the extent of the noises. Very well maintained community and close to local shopping such as Harris Teeter's, Subway, Verizon, and various other stores and shops. Beautiful Place with Good Staff but not Perfect.submitted by Vincent T. - Aug 27, 2018 |Recommended: YesIt's one of the more attractive apartments with decently good staff. A work order that I put in took a week longer than they promised to get taken care of 3 instead of 2 weeks . You have to pay 200 for amenities fee, which is one of their major selling points but they refuse to replace their community grill brush, where the bristles are practically gone and need replacing. Don't get me wrong, I do like their amenities but with a fee like that I expect them to do that small service. Spacious and absolutely gorgeous place, but something gives me a feeling that the people who built this place were focusing more on the aesthetics than design. The walls are fairly thin so you can hear people's footsteps, especially your roommates. Also, I have one of the corner rooms, and my bathroom has just too much unnecessary space. Aura is decentsubmitted by Lanisha T. - Aug 24, 2018 |Recommended: YesThey are pretty decent to live at. The neighbors are all friendly. Staff is friendly too. I actually have no complaints. It's a nice and clean place to live.submitted by Samuel A. - Jul 31, 2018 |Recommended: YesIt's what you'd want. Everything's in reach but never in the way.I'm a private person not anti-social so I like to be able to take care of most of my needs after work without having to run around town. 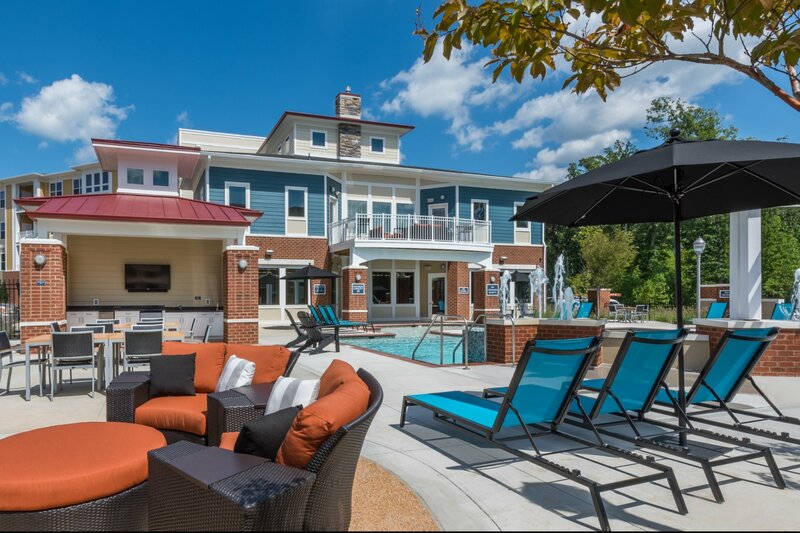 The pool and workout equipment available on the property as well as having a Harris Teeter down the street makes it easier to relax after work.